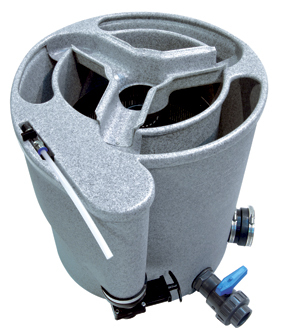 The EazyPod is the complete mechanical and biological filter system for garden ponds up to 20,000 litres or Koi ponds up to 10,000 litres. The EazyPod has been modified for 2012. The inlet on the new EazyPod features a welded 1½" Slide Valve with 1½" hosetail, making pump fed installation even easier. The waste on the EazyPod has also been made simpler with the introduction of a 1½" Slide Valve. line, a great all rounder!